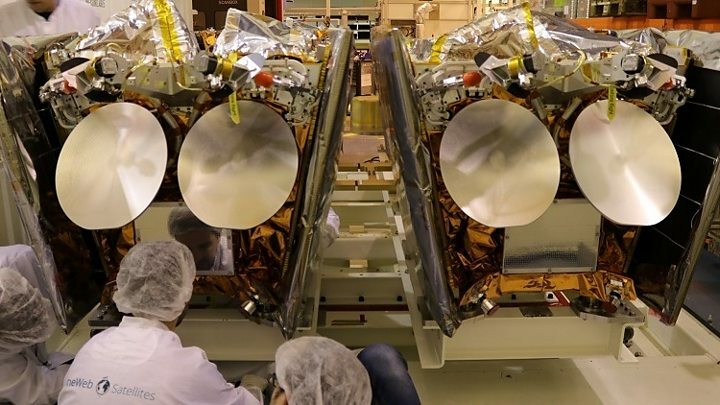 The first six satellites for OneWeb’s mega-constellation have launched on a Soyuz rocket from French Guiana. The spacecraft are the pathfinders in a network the London-based start-up is building to take high-speed broadband internet to every corner of the globe. Other companies have similar plans, but OneWeb believes it has first-mover advantage with an operational system. The Soyuz left its Sinnamary base at 21:37 GMT for a flight that lasted one hour and 22 minutes. Controllers in Virginia in the US, and in the UK capital, were primed to talk to the satellites as soon as they came off the top of the Russian rocket. The platforms’ most important task is to secure the frequencies needed to relay the coming network’s internet connections. Assuming the pathfinders perform as expected, OneWeb will then begin the mass rollout of the rest of the constellation towards the end of the year. This will see another 20 Soyuz rockets launching every month, lofting up 32-36 satellites at a time. To provide global internet coverage, there will need to be 648 units in orbit, but the ultimate number could rise to around 2,000. And to underline this ambition, a further flight was added to the schedule on Wednesday; a mission aboard Europe’s forthcoming Ariane-62 vehicle. “We don’t really know everything we can do,” said OneWeb CEO Adrian Steckel. The company was started by American telecoms entrepreneur Greg Wyler. He’d previously founded another constellation called O3b, which stands for “other three billion” R11; a reference to that half of the planet without connectivity. O3b operates a fleet of 16 satellites moving around the equator at an altitude of 8,000km. OneWeb is Wyler’s even grander vision – a much denser network that flies just 1,200km above the ground. The satellites’ nearness, their high throughput – over one terabit per second across the constellation – and global coverage promises to transform internet provision for those who are currently underserved, or simply un-served. At least that’s the view shared by OneWeb’s partners, who include companies such as chip-maker Qualcomm, Sir Richard Branson’s Virgin Group, drinks giant Coca-Cola, satellite communications specialist Hughes, and tech financier SoftBank. How big an undertaking is this? Massive. Satellite technology is much, much less expensive than it used to be, and the large number of satellites needed for the network reduces the unit cost. Even so, the spacecraft being turned out by OneWeb partner Airbus have a price of about one million dollars. When you add in all the ground infrastructure needed to operate the system, the overall expense runs to more than three billion. Some past satellite ventures that sought to build big constellations went belly up. Satphone companies like Iridium and Globalstar only exist today because bankruptcy proceedings relieved them of their debt. Several other groups have registered their interest in competing with OneWeb, including Elon Musk’s SpaceX company. Musk’s engineers even have a couple satellites in orbit now to demonstrate technologies. Commentators seem sure of only one thing: the market will not support all of the proposed mega-constellations. What’s the UK angle here? OneWeb has based itself in west London. They’re actually using offices vacated by the BBC. The company has about 70 staff now and expects to raise this to roughly 200. Satellite and network operations facilities are being built up in London – as well as in the US. Successive UK governments have tried to foster a business and regulatory environment that encourages space businesses to make Britain their home base – and they’ve succeeded, believes Mr Steckel. “We think that the UK Space Agency (UKSA) has done a fantastic job, looking at what OneWeb could be as a disruptor in the satellite industry and in terms of expanding the use cases (for our services),” he told BBC News. The UKSA spends significant sums on satellite telecoms R&D. It does this through its membership of the European Space Agency. 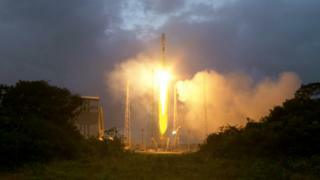 Esa develops new technologies that will hopefully keep European companies globally competitive. And the UKSA has just put £18m into a programme that should benefit OneWeb‘s later generation of spacecraft, in particular in the way they interact and work alongside the terrestrial 5G mobile networks that are now being instigated. Isn’t space already too crowded for this? This is a hot topic. There is something like 2,000 working satellites in orbit now, flying at various altitudes; and a slightly larger number of legacy spacecraft that have ceased operations. If several mega-constellations are launched, it will significantly increase the orbiting population – and that has experts worried about the potential for collisions. A recent study – sponsored by the European Space Agency and supported by Airbus – found that the new networks would need to de-orbit their old, redundant spacecraft within five years or run the risk of seriously escalating the probability of objects hitting each other. OneWeb says it has taken this message fully onboard. Indeed, the UKSA, as the licensing body, has worked closely with the company to make sure its old hardware will come out of the sky very quickly. “All successful applicants for Outer Space Act licenses must demonstrate compliance with established best practice in terms of safe and sustainable operations,” a spokesperson said.